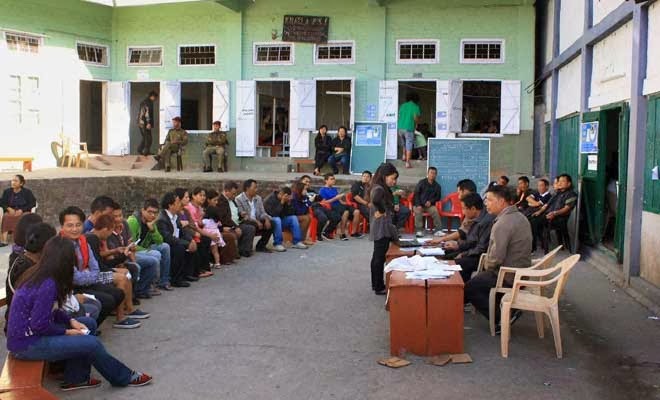 Re-poll would be conducted in Republic-I polling station in Aizawl South-I constituency on Thursday due to reports of alleged malpractices by one polling official, Mizoram's Joint Chief Electoral Officer H Lalengmawia said. Lalengmawia told a news agency Tuesday evening that the re-poll was ordered after the decision was made by the Election Commission following complaints from a number of voters and the decision of the Commission came late this evening. A polling official in the polling station allegedly told voters to push a particular button, the third one (that of the Congress candidate's) and the complaint was lodged to the state election department by the Zoram Nationalist Party (ZNP) after two women voters lodged a protest. Some voters also alleged that the polling officer was acting like a peeping tom when they were casting their votes. Candidates in the seat included the sitting legislator K Liantlinga of the ZNP, R Vanlalvena, former student leader, of the ruling Congress, who had contested and lost in 2008 state assembly polls and RK Lianzuala of the main opposition Mizo National Front (MNF), a well-known television personality. In the ongoing investigation into allegations of a political party working with armed rebel groups to intimidate voters in Mizoram's northern regions bordering Manipur ahead of the just-concluded assembly polls, Mizoram Police on Tuesday arrested a man in Sakawrdai town and booked him under various criminal cases. The accused, Darliansanga, has been booked under IPC sections 506 (criminal intimidation), 153 A (promoting disharmony, enmity, hatred or ill-will between communities) and 171 F (undue influence or personation at an election) and was being brought to state capital Aizawl in the afternoon. A police spokesperson said Darliansanga was nabbed by police after finding out he had telephoned members of the Hmar Peoples Convention Democratic (HPCD) and telling them, "Your candidates are not likely to win, you must intimidate the people some more for them to win." The accused is a small-time contractor whom police said has been an "active supporter of the HPCD". Police said they had been tracking intimidating phone calls from inside Manipur to community leaders in three Hmar tribe dominated constituencies of Mizoram as election campaigning began and that more arrests are likely soon. Meanwhile, the CEO's office, Mizoram, has referred to the ECI a case in which a polling station has registered 26 more votes than the number of voters who exercised their franchise there. The polling station is the same station where police on Monday arrested a polling officer for allegedly instructing voters to press "the third button on the EVM". The arrest had been made after rival political parties had lodged a complaint against the official.